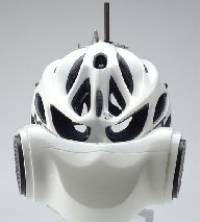 Industrial design and technology student Luke Pannell has designed a helmet that could help cyclists breath easier and look like some crazy geeked out Jason or a huge renob. Designed to filter out irritable particles that cause asthma sufferers and hay fever victims to veer into oncoming traffic because of a sneeze attack, the helmet dispenses of exhaled air through plastic tubes while a shield covers your nose and mouth. I think it makes you look like a badass and this is way cooler than a BMX helmet I’ve always wanted. People will think twice before messing with someone who dons this headgear. If the helmet’s inventor can find a manufacturer then we may see these on the market for about $220.